Gas Sensors from Dynament We design and manufacture gas sensors using patented miniature Infrared (IR) gas sensing technology. The sensors are made for use by Original Equipment Manufacturers (OEM's) of gas monitoring and detection products. Dynament now supplies its infrared sensors to over 400 customers in 40 countries including all of the worldwide major gas detection OEM's. Over the past 10 years our customer base has grown to such a level that we now have over half a million sensors in use worldwide . 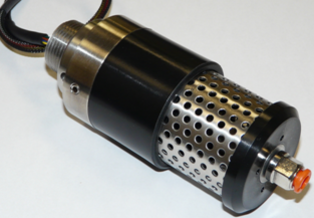 Our sensors have gained a worldwide reputation for excellent performance and reliability and each infrared sensor undergoes exhaustive environmental testing and characterization prior to delivery to the customer. The sensor designs are based on PROVEN TECHNOLOGY and, as such, we are able to offer a 5 year sensor warranty on most sensor types. 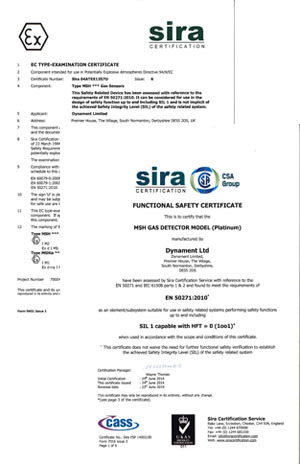 We can now offer SIRA EN50271 & SIL1 certified versions of both our 'Ex' and 'Non-Ex' sensor types. *An approximate 80% reduction in current consumption compared with the Premier sensor range. These new sensors are compatible with our existing ranges with all sensor variants available in the new lower power format. They utilize the same technology as our existing ranges which have proven themselves over the past 10 years with over 500,000 in use worldwide in 40 countries in a variety of industries and applications. They have the same 5 year warranty.